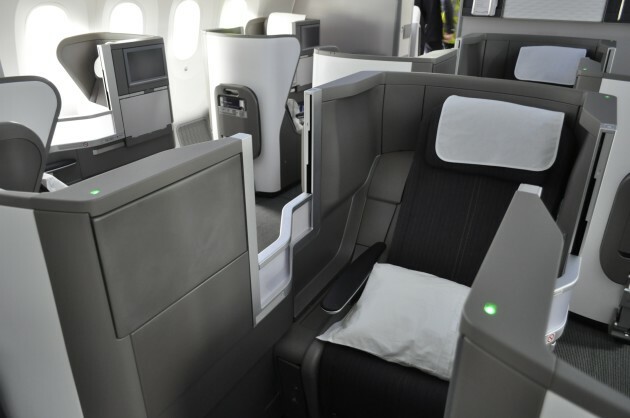 British Airways has now loaded sale fares for 2018 & 2019 travel to destinations worldwide in their Club World Business and First Class cabins. Once again, Continental Club is ahead of public promotion, and therefore readers have the best chance to grab any limited availability. Travel dates vary by destination as usual, reflecting seasonal demand variations. 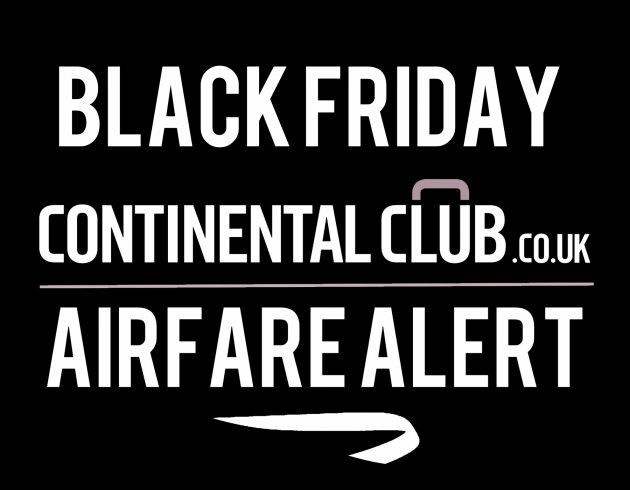 Fares must be booked by 23:59 BST on 25th September 2018. An official ‘Sale’ page has been published to the airline’s website at ba.com, so the BA Low Fare Finder at ba.com is the best way to check the new fares and availability. Overall, Business Class and First Class fares are 1% higher on a simple average basis, compared to the last sale at Christmas. In South America, Buenos Airies is back at or below £2000 in Club World, as is Rio de Janeiro, Santiago and Sao Paulo. Although Club fares to Mexico City have gone up, First Class fares are 10% lower than last time, and Sao Paulo drops from £3825 to £2960 in First. 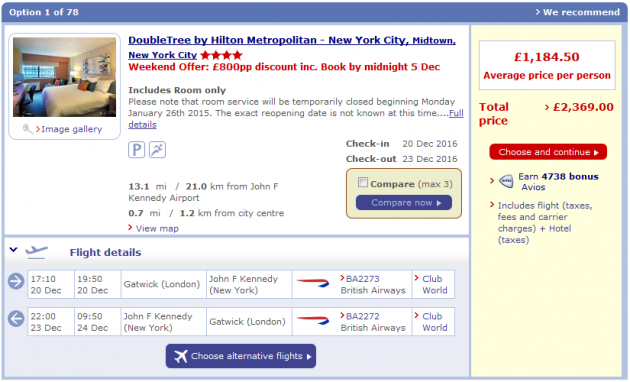 In North America, Boston, Chicago, New York, Philadelphia and Washington are all at or below £2000 return in First Class. Fares to other regions are arguably less notable, although First Class to Singapore from £2781 is rather better than we have seen lately. For a list of currently available longhaul destinations and starting Club World and First Class fares, scroll down or click ‘READ MORE’ below. The listing includes the equivalent fares from the last full sale in December 2017, rather than the limited North America only April 2018 promotion, which was destination-restricted. 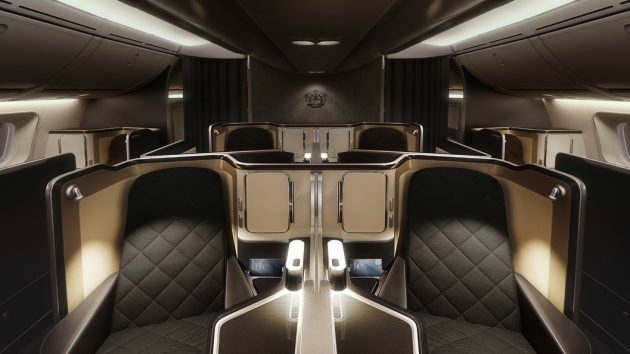 British Airways is now loading a Luxury World Sale for 2017 and early 2018 travel to destinations worldwide in their Club World Business and First Class cabins. As usual, Continental Club is ahead of public promotion, and therefore readers have the best chance to grab any limited availability. Travel dates vary by destination as usual, reflecting seasonal demand variations. Fares must be booked by 23:59 GMT on 23rd May 2017. 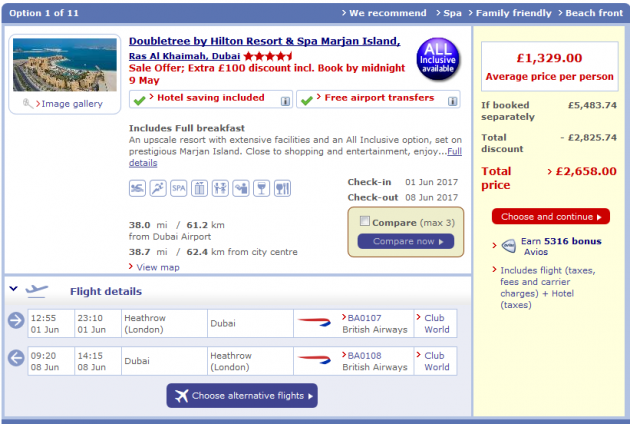 As an official ‘Sale’ page is yet to be published to the airline’s website at ba.com, the BA Low Fare Finder at ba.com is the best way to check the new fares and availability. Per the highlighted text in this screen grab, the book-by date for this promotion is 9th May 2017, however, rather than 23rd May for the main flight-only Sale. Overall, Club World fares are 8% higher on a simple average basis than those offered in the last sale, and First Class fares are 2% higher. As usual, some of this can be attributed to seasonal variations, with different travel periods featuring in consecutive sales. Generally-speaking though, North America seems to have been sprinkled with the least amount of Sale dust, with Club fares on average 11% higher than in the last sale. If there’s a standout fare in this sale, it would appear to be Club World to Punta Cana in the Dominican Republic from £1192 return – which is £103 cheaper than in the last sale. For a list of currently available longhaul destinations and starting Club World and First Class fares, scroll down or click ‘READ MORE’ below. The listing includes the equivalent fares from the last full sale in March 2017. All pictures are our own. British Airways has followed-up its Black Friday and Cyber Monday promotion with flash savings on Club World business class and First Class prices to New York – when booked in conjunction with hotel accommodation. The so-called ‘Inclusive Tour’ or IT fares are non-refundable and non-changeable, but offer advertised additional savings of up to £800 per person. 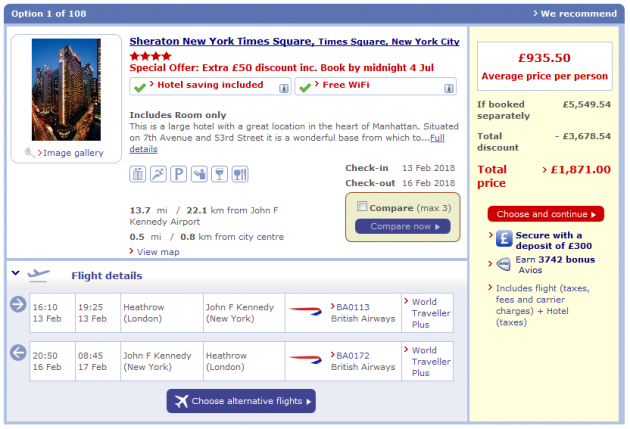 The fares are bookable now at ba.com, and are featured on the airline’s ‘Club World Deals‘ page, with sample offers of 3 nights at New York’s DoubleTree by Hilton Metropolitan Hotel from £1184.50 per person, including return Club World flights from London Gatwick – undercutting even the headline advertised price slightly. All prices are based on two passengers travelling together. Flights booked in this offer qualify for Avios and Tier Points in the British Airways Executive Club, and members of the club at the Bronze level and above benefit from all amenities associated with their level of status in the programme, including (as relevant) fast track security and boarding, lounge access and seat selection. In addition, bonus Avios are awarded to Executive Club members for BA Holidays booking, as shown in the screenshot above. 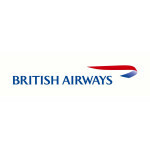 Note that IT fares do not earn points in the BA OnBusiness SME Loyalty programme, however. Offers are valid for selected travel dates between 20th December 2016 & 1st January 2017. The booking deadline is midnight 5th December 2016. To check availability and to book, visit ba.com.